Looking to buy a bike pump but unsure which one to get? You’re at the right page. Picking the right bike pump can sometimes be a tough decision because there are so many out there. But only very few good quality ones. There are floor pumps, hand pumps, mini floor pumps and track pumps. To make things a little more complicated, each one has different usage and are marketed differently. As a road cyclist, you’d want to have a really good quality floor pump at home and a mini or portable bike pump attached to your bike for repairing punctures mid-ride. Here are 10 of the best floor and mini bike pumps you might want to consider. The Lezyne CNC Travel Drive falls somewhere between a bicycle floor pump, portable pump, and mini pump. In fact, it’s a sweet combination of all three. Blending the best in size, construction quality, and efficiency, the Lezyne CNC Travel Drive requires very little effort to get your tires inflated. It also don’t take much space in your bike bag if you carry it for travels. It’s smooth, yet rugged CNC lightweight aluminum construction makes it a pleasure to look at while the quality construction ensures it’ll last for many years to come. 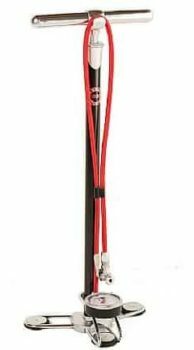 Topeak’s Joe Blow Sport series has set the standard for years when it comes to bicycle floor pumps. Next time when you’re at a cyclist’s house, take a look at the bike pump they’re using. Odds are, they’ve got a Topeak bike pump somewhere in the garage, or they’ve previously owned one. With a massive 3″ analogue gauge, a steel barrel, a padded ergonomic handle, and TwinHead DX valve head, the feature-rich Joe Blow Sport 3 takes its heritage to a new level and makes inflating the tires effortless. Vibrelli has been making waves with its faithful reproductions of classic designs combined with updated materials as well as a lower pricing. Their Performance Floor Pump sports a rapid T-Valve that allows you to quickly between a Presta and Schrader valve. 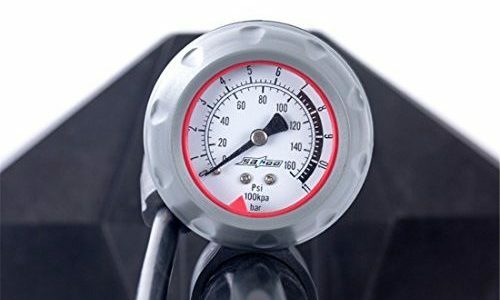 It’s capable of inflating up to 160 PSI via the strong steel barrel, and all observable via the large and easy to read air pressure gauge. With a 15-year warranty backing it, the Vibrelli pump is here to stay. From the moment you lay your eyes upon the Velowurks Prime Floor Pump, you know you’re looking at a special piece of bike equipment. Engineered with classic cycling heritage references in mind, the Prime Floor pump picks up with Gino Bartali, Fausto Coppi, and the great Eddy Merckx left off. 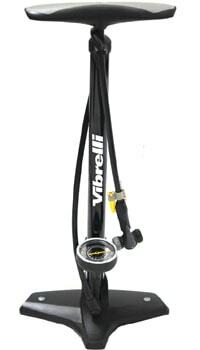 Capable of pumping up to 250 PSI, the Prime floor pump is built using an anodized aluminum throughout, features a beautiful anodized aluminum gauge between two plated steel and rubber feet, and an extra long braided hose. 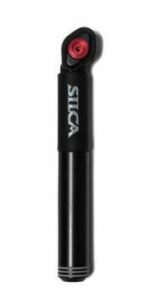 The Silca SuperPista is the classic pump against which all other bicycle floor pumps must be judged. Don’t be fooled by its heritage looks. The SuperPista remains the pump of choice for many cyclists worldwide to this very day. Featuring a wood carved handle, incredible looks, and sublime performance via a single stage 254 gasket, the steel plated SuperPista stands the test of time and is a piece of bike equipment you can pass on to the next generation. Getting a flat tire when you least expecting it is a sure way to put a downer on your ride. But if you’re carrying a Pro Bike Tool Mini Pump, it doesn’t have to be. That’s because with this mini pump on hand, you’ll be back on the road in no time because this is a powerful mini pump that is comparable to what you can achieve with a bike floor pump at home. With a dual Presta or Schrader valve head, you can use it for both your road and mountain bikes. The Road Morph G isn’t exactly a mini pump, but that’s not a bad thing. Mini pumps can be a real hassle especially if it’s hot and your hands are sweaty, fumbling around with a tiny pump can be downright annoying. Topeak’s Road Morph lands squarely between mini pump and floor pump status, meaning less pumping strokes for the same amount of air compared to other mini pumps. It also conveniently stashes away along your seat tube and features an in-line gauge so you can accurately inflate your bike tire. The Mosonth Mini goes big on lightweight materials to keep its size and weight down for the most feathery carry possible. While that’s great for the weight weenies out there, be advised that the lack of an extendable hose means you’ll have to get up close to the tire valves to pump it up. 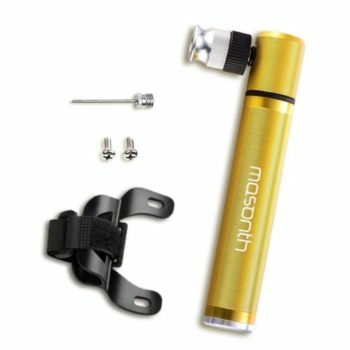 For its tiny size, the Mosonth is capable of a maximum of 160 PSI and is both Presta and Schrader valve compatible. Keep the Mosonth with you when you need a just in case pump, but go with something sturdier for those faraway and remote rides. 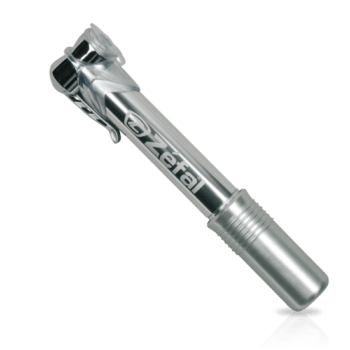 Zefal is well known for their reliable mini pumps and the Air Profil Micro perfectly fits the bill. The pump is constructed entirely of aluminum, comes in at only 88g, and fits seamlessly into your back pocket. An ergonomic grip keeps your hand in place when you’re pumping. The included frame mounting clip keeps it mounted near your water bottles. Just when you thought mini pumps couldn’t be cool. The Silca Pocket Impero is a stylish and functional piece of equipment that punches way above its weight. Constructed out of CNC machined aluminum and featuring a perfectly ergonomic body attached to a brass check valve, 3mm thick leather gasket, and aluminum valve head, the Pocket Impero is very handy when you get a flat tire. Bike pumps come in various types, sizes and usage. Here are some of the commonly found ones. The floor pump is arguably the most common type of bike pump found in most cyclists home. They can be made of either aluminum, steel or plastic. 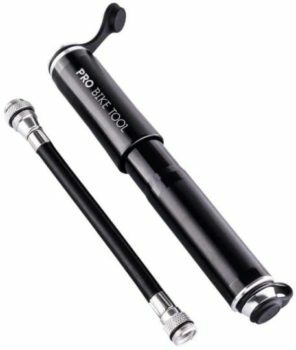 The long barrel and piston shaft allows you to quickly and easily pump up your road tires to high pressure as they can push a large amount of air. There’s an air pressure gauge to indicate the air pressure you’re at. A subset of floor pumps is the track pump. As the name implies, they’re designed for track bikes, which require even higher air pressure, usually above 160psi/11bar. Sometimes, it’s also referred as mini pump or frame pump due to its smaller size and being mounted on the bike frame. Because it’s smaller, it doesn’t pump up to high pressures. Pumping gets harder as the air pressure increases. Hand pump usually max out at around 100psi/6.9bar and is enough to get you home safely. Most of them don’t come with an air pressure gauge, so you’ve to use your finger to pinch the tires to get a feel of the air pressure. Some models have a retractable hose, making pumping slightly easier by the roadside. It’s smaller than a floor pump but larger than a hand pump, making it a hybrid version of both. Some models are small enough to be carried in your back pocket. Because it’s slightly larger version of the mini pump, it’s easier to pump and they can usually go up to around 120psi/8.3bar. The CO2 inflator is a fast and easy way to inflate your tires in mere seconds. It works together with CO2 cartridges that hold a fixed volume of air. These days, there are 2 types of valves used in bike tubes. 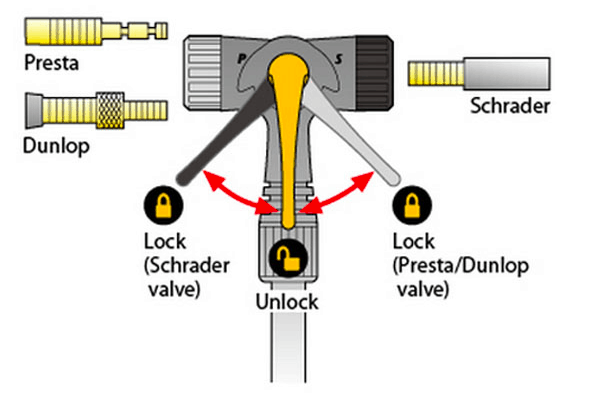 Most bike pumps today are compatible with both Presta and Schrader valves. Some pumps support both types of valves, while some would require you to manually switch between one and the other. You can easily do this by opening up the inflator head, and flip the rubber and plastic pieces. Also known as the French valves, they’re the thinner valves used in all road bikes because they can take a higher air pressure. In order to use a Presta valve, you’ll need to unscrew the top screw at the top before you can pump, and then tighten it back so that it doesn’t accidentally get depressed and release the air. Since road bike rims are narrow with less spacing between the tire beads, adding a hole in the rim will significantly reduce the cross sectional strength. 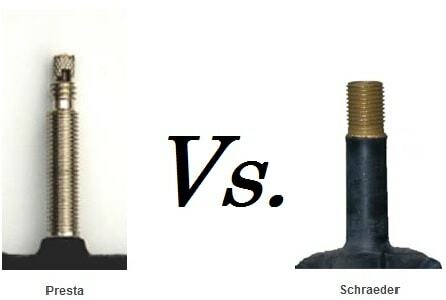 Hence, Presta valves are used due to its thin nature and requires only a small hole compared to Schrader valves. Also known as the American valves, they’re the thicker valves and more commonly used. They can be found in cars, mountain bikes and kids’ bikes. They’re easier to use compared to the Presta valves. All you need to do is to remove the cap and insert the inflator head. In fact, you can easily pump up a Schrader valve at the gas station. Floor pumps like the Topeak Joe Blow Sport 3 and Velowurks Prime have twin heads, so you don’t need to manually switch them around. PRO TIP : Presta valves are used in road bikes and Schrader valves in mountain bikes, kids bikes and cars. The bike pump’s build quality is the one place you’ll want to make sure you don’t skimp. There’s nothing quite like having a well-built and bomb-proof pump at home. The best bike pumps are usually made of steel or aluminum. The sturdiness of these metals gives your a feeling of solid, reliable and high quality pump, especially if you’re pumping anything above 60psi/4bar. Since steel or aluminum pumps are more sturdy, they generally give you a higher air volume per stroke. Hence, making life much easier for you. The Silca Superpista is well-known among cyclists for its super high quality build and will last you for decades. For that, it comes with a heavy price tag. On the other hand, plastic pumps are lightweight, cheaper and easier to carry around especially to races. While they might not give you the high quality feel, they still perform the job well. PRO TIP : Go for a bike pump with aluminum or steel barrel. Gauge preference has more to do with reliability than you might imagine. A digital gauge might seem cool, nice and easy to read. But the problem with a digital air gauge is that the electronics are vulnerable to malfunction and the battery running out. On top of that, a similar bike pump with digital air gauge generally cost more. You’re paying for the electronics instead of the build quality. For that reason, I’d recommend to stick with the old school analogue gauge. They won’t let you down. PRO TIP : Go for a bike pump with analogue air pressure gauge. 1. Can the bike pump inflate the car tire? Yes it can since car tires are the standard Schrader valves. However, it’ll take a lot of effort to fully inflate a car’s tire as they’ve a much higher volume compared to a road bike tire. At 32psi/2.2bar, the car tire has about 10L of air volume compared to the bike tire which has approximately 4L at 85psi/5.9bar. 2. How do I convert a Presta to Schrader valve? You can convert Presta to Schrader valve using a screw in adapter. By using this adapter, you can inflate your bicycle tires at the gas station, since the pump inflator heads only support Schrader valves. Most gas station pumps only go up to 80psi/5.5bar. Once you’re done, remember to turn the air pressure setting down. 3. How does a bike pump work? The bike pump has a piston connected to a handle at the top. Inside the barrel (body), there is an inlet and outlet valve which control the air flow. As the piston is pulled up, the inlet valve opens and lets the outside air into the barrel. 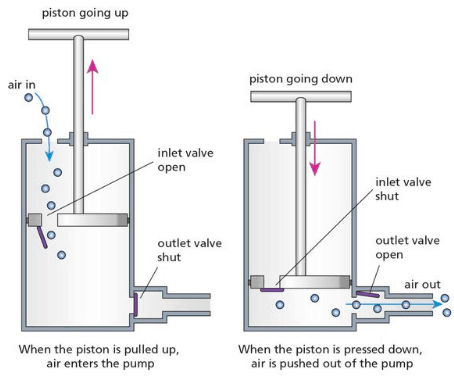 When you push the piston downwards, the inlet valve shuts and the outlet valve opens. As you push the piston further downwards, the air is compressed and pushed outwards through the hose and eventually to the bicycle tires, via the inflator head.